What Is It? The #201 Hunter/Camper knife is a wonderful multipurpose knife from Jay Maines of Sunrise River Custom Knives. Jay is a one man, custom knife making operation, who does everything himself except heat-treat the blade, which he contracts out to a company that specializes in such tasks. Knives from Sunrise River Custom Knives are some of the best custom knives you can buy anywhere. The Good. I’ll say up front that I’m not a knife expert. I like to cut sticks when I’m in camp for fires, whittle a stick or two into something that resembles a whittled stick, and cut my bacon in the morning. I don’t skin any animals, and I’ve never used a knife to save a life. But, if I ever found myself needing to do one of those things, I’d be happy to be packing the Hunter/Camper knife with me. It has a weighty feel to it, which gives me confidence in its abilities. With steel extending through the length of the handle (a “Full Tang” knife), it’s durable enough for even the toughest bacon strip! And with it’s stong, custom grip, it’ll never break when I’m trying to cut a log for the fire. It feels viturally indestructable, and looks great. Jay lightly etches a logo into the blade – deep enough so you can see and admire the craftsmanship, but not so deep that it collects crud and stuff. My knife came with a great leather sheath – Jay has several types of handmade sheathes to compliment his knives. The Not So Good. Like I said earlier, I’m not an expert with knives. So, for me, there was absolutely nothing bad to report about this knife – it did what I asked of it, and it did it well. I felt confident that my knife could withstand anything I threw at at. I showed my knife to a few of my friends who are hunters, and they went absolutely nuts over it! How To Get It. You can purchase any of Jay’s knives by heading over to Sunrise River Custom Knives and checking out his offerings (sunrisecustomknives.com). 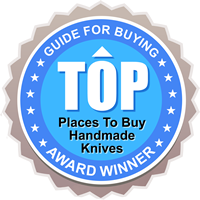 You’ll find over 30 different knives available for purchase. Jay also makes custom sheaths, and can probably do just about anything with a knife/sheath you need. Just ask! Sunrise River Custom Knives is your place to go for great custom made knives – whether you need it for serious hunting, or just for making a marshmallow stick in camp!